Meeting with an immigration lawyer during an initial consultation is an important step to acquiring a visa, becoming a resident, or avoiding deportation – among many other reasons. Many people find the topic of immigration to be stress-inducing and fearful. However, a good immigration lawyer will help you feel safe and secure. First and foremost, it is better that you ask the tough questions and bring up the uncomfortable scenarios to a private lawyer instead of the U.S. Citizenship and Immigration Services (USCIS) or U.S. Immigration and Customs Enforcement (ICE) personnel who may not care and will deny your application or deport you immediately. To make sure an immigration lawyer has your best interests in mind, make sure to ask some of these essential questions during your initial consultation. If you feel threatened or as if the attorney is trying to get your service as just another paycheck, please walk away and call another lawyer for a second opinion. Your future is on the line, and it is not worth throwing away to a lawyer who doesn’t care about your rights. Are you a member of the New York State bar? 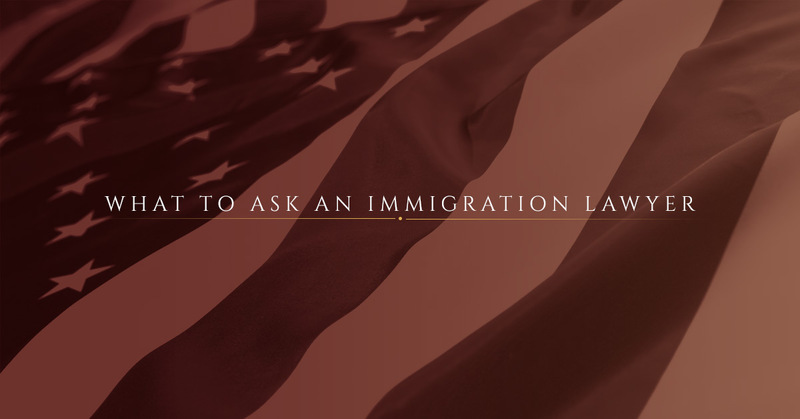 Are you a member of the American Immigration Lawyers Association (ALIA)? Do you specialize in immigration law? If not, what are other services you provide? What is your strategy in my case? What successful results have you gotten for others in similar shoes to mine? Will you be handling the case directly, or who else will be involved? How frequently can I expect communication or updates about my case? What is your cost, and what is included in the fees? What are your qualifications and certifications to handle my case? Do you think there is a chance for success? How many other caseloads are you handling? Will my case get the attention it deserves? What is the estimated timeline to expect an answer? Do you have references of previous clients I may call? Can I trust you to be a better lawyer than others in the area? What documents do you need me to provide? How else can I be of assistance during this process? Diron Rutty is an immigration attorney who wholeheartedly supports the desires of aliens who wish to visit the United States or become legal citizens. A lawyer can help to navigate the confusing and frequently changing laws, file paperwork on the path that will have the most potential for a successful outcome, and be fully honest with the sometimes harsh and brutal truths that exist with immigration. More than that, our lawyers can provide personal support and serve as a patient vessel along the journey. We offer a full range of immigration services to clients in the New York City, Queens, Bronx, Brooklyn, and Hudson Valley areas. Moreover, Diron Rutty has a close personal connection to the Caribbean and can help individuals and businesses with legal services in Jamaica, Antigua, and the West Indies.